Patra's Other Place: Lest We Forget. 25th April 2013. This is probably one of the most important days on the Australian calendar, and rightly so. 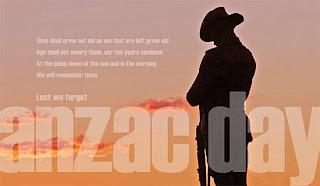 Anyone reading this who does not live in Australia, and does not know the meaning of ANZAC, I suggest you 'google' ANZAC Day to find out more.